Carol Ryan Dumas/Capital PressTim Cornie pulls plants from the field of a cover crop to check the soil below on his transitional ground in Buhl, Idaho. Carol Ryan Dumas/Capital PressA familiar sign bordering organic farms in Idaho marks a field Tim Cornie is transitioning to organic in Buhl, Idaho. Carol Ryan Dumas/Capital PressTim Cornie discusses beneficial bugs in his corn crop with Darcy Sexton, a student of soil microbiology who is helping him analyze and build soil health on his farm in Buhl, Idaho. Carol Ryan Dumas/Capital PressNew organic grower Matt Townsend prepares to operate a tractor at Sunset Butte Ranch in Buhl, Idaho. Carol Ryan Dumas/Capital PressFounded in 1904, Sunset Butte Ranch is transitioning to the next generation. Carol Ryan Dumas/Capital Press Matt Townsend looks over his mentor's organic potatoes being boxed for market on Sunset Butte Ranch in Buhl, Idaho. Carol Ryan Dumas/Capital PressNew organic grower Matt Townsend prepares to start a tractor at Sunset Butte Ranch in Buhl, Idaho. 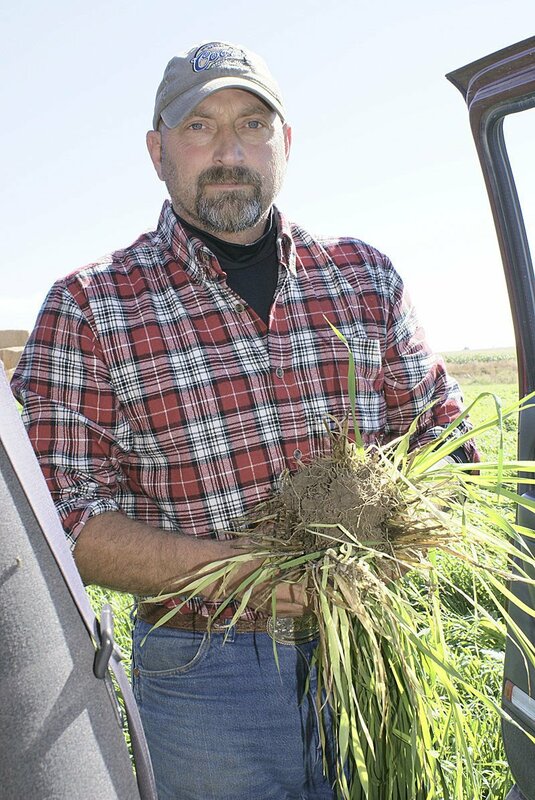 BUHL, Idaho — Third-generation farmer Tim Cornie ventured into organics eight years ago on his farm near Buhl, Idaho, but his enthusiasm was no match for the weeds that came with the transition. He ended up reverting to conventional production on three-fourths of his 500 acres. But he’s trying again, going at it from a biological angle, employing “green manure” (plants grown and plowed back into the soil as fertilizer), cover crops and a customized compost brew to build healthy soil and manage weeds and pests, he said. His rotation includes alfalfa, field corn, dry beans and barley, and he plans to add sweet corn and sugar snap peas next year — if a contract comes through. The demand for organic food is strong and organic production can be profitable for small farmers, but making the three-year transition required for USDA certification is difficult, he said. “Yields are less, and you farm organically for three years before you get paid for it,” he said. Meanwhile, the weeds are an eyesore, he said. “You’re going to be criticized. People are used to things looking pretty; it’s not pretty,” he said. But it’s part of building a healthy ecosystem — and if you can manage the weeds, it becomes profitable, he said. In both attempts, Cornie has found no two years are the same in organic farming, and everything is part of a steep learning curve, he said. And there’s a lot of paperwork. Everything has to be documented, he said. The impetus for going organic has to be more than money. It’s about producing a healthful product, he said. Demand for organic food is booming with no sign of slowing. It far outstrips production and has boosted U.S. organic farmgate sales by 72 percent since 2008. On-farm organic sales reached nearly $5.5 billion in 2014, the USDA National Agricultural Statistics Service reported in its 2014 Organic Survey, which was released last month. Given the growing appetite for organic products, the industry could soon move beyond its current 5 percent of the U.S. food supply, according to the Organic Trade Association. To say there’s abundant opportunity for farmers is a “gross understatement,” said Nate Lewis, OTA senior crop and livestock specialist. U.S. organic retail sales, including non-food products, hit $39.1 billion in 2014. That’s an 11.3 percent increase year over year, outshining the 3 percent increase in comparable conventional sales, according to OTA. “Demand is far outstripping supply, especially for grain and pulses,” Lewis said. But significant obstacles to getting into organic production remain, he said. The greatest challenge is the financial hurdle of the three-year transition. Without the use of conventional fertilizers and pesticides, the producer is faced with lower yields but is not yet able to receive the higher prices certified organic crops generally bring, Lewis said. Playing into that is a lack of organic-specific technical assistance, which runs the gamut from USDA agencies to university extension specialists, he said. In addition, crop insurance has largely been unavailable for organic production, he said. “Support and a safety net have been lacking in the organic sector,” he said. Some transitioning farmers have it a little easier than others. Matt Townsend’s land is already certified organic, but he has to learn how to farm it. Taking an early buyout from United Airlines, where he worked for 27 years as a mechanic, he had planned to farm on a small conventional farm he purchased near Wilder, Idaho. That plan changed when he met and became engaged to Joan Heath, an organic farmer’s daughter. He has spent two summers working for Joan’s father, Mike Heath, on his Buhl farm. He then farmed with him last year and has just completed his first year on his own on the family farm. Townsend said he knew a bit about farming, but he can’t imagine going into organics without a mentor. Heath invited Townsend to learn from the mistakes he has made in more than 25 years of organic farming. Because of Heath’s experience, Townsend said the learning curve hasn’t been quite as steep as it otherwise would have been — although this year was harder than last year. Townsend realizes his transition to organic is unique. He didn’t have to weather the three-year transition period, but it is still demanding, he said. “You really have to be on top of it. If you get behind, you really don’t have anything to fall back on. The weeds are the big thing. If you get behind, it’s going to hurt your yield and make a mess of things,” he said. Healthy price premiums are creating a lot of interest in organic farming, more than OTA has ever previously seen. But there aren’t many farmers making the move, which underscores the financial barrier and lack of technical assistance, the OTA’s Lewis said. “Despite prices, if you can’t make it through that three years (of transition), it’s not a viable option,” he said. For instance, there is a dire need for organic grains, reflected by the drastic increase in organic corn and soybean imports. But with the recent plummeting prices in the conventional sector dragging down organic prices too, those farmers might not be in a financial position to weather the transition period, he said. Organic oats, wheat, corn and soybeans are in the greatest demand right now, with some wheat contracts paying four times the conventional price and some corn and soybean contracts paying three times the conventional price, he said. “The premium is dangling a carrot on the stick. But it’s so far away, they can’t see how to get there,” he said. “We need to be meeting producers where they are. We need that on-ramp. What gets complicated is how to build that on-ramp,” he said. The industry needs to share in that financial hurdle, he said, adding that some companies do that through a direct relationship with the producers who will be supplying them. The industry also needs to institutionalize transitional certification, perhaps through USDA’s Process Verified Program, to enable transitioning producers to market their crops at some premium, he said. While USDA is genuinely interested in extending the safety net to organic producers and has made some recent improvements, it’ll take a fundamental shift in the agency in everything from crop insurance to conservation programs, he said. “You can’t just add the word ‘organic’ and have it work,” he said of USDA’s programs. Other areas of need include organic research aimed at weeds, pests, plant breeding, apprenticeship programs, a stable labor force and bringing young farmers into agriculture, he said. OTA is addressing all these issues, he said. Given current strong demand and high prices, longtime organic growers anticipate more entrants into their industry. But it’s not for everyone, they warn. It takes commitment and a different style of management, and there are no quick fixes, Heath, the organic farmer, said. Some get out as quickly as they get in, feeling it’s just not worth it, he said. It takes talent, and there are always bad years, just as there are in conventional agriculture, said Nate Jones, who has run a diversified organic farm at King Hill, Idaho, for more than 25 years. People get in, have a bad year, think it’s too much of a headache and get out, he said. The two veteran growers, however, are ready to help newcomers to organic production — which they say is as much philosophy as it is practice. The hardest part is the transition phase, and the best way to get through it is to grow alfalfa. It’s easy to sell and take care of, offers good weed control and soil fertility, and insects can be controlled by the timing of cuttings, Heath said. Ground coming out of conventional production might not support other crops, and three years of alfalfa will result in good soil condition, he said. The best thing to put in is pasture and grass and graze it so the soil builds up. But alfalfa is great because it cleans up any weed problem and gives the ground a rest from tillage, Jones said. It’s less temperamental than row crops and with the obvious learning curve in going organic, it will give a grower time to learn and research before jumping into row crops, he said. “Take advantage of those three years” of transition, Jones advised. Aside from getting the ground in good, fertile condition, composting and crop rotation, Heath advised newcomers to learn to live with a certain amount of weed pressure and still come up with a good crop. “Learn to control them to a point, but don’t get too excited; there are ways to deal with weeds,” he said. In the long run, a good organic system will have fewer weeds and insects, he said. Jones agreed, saying that yields will improve over time and producers will benefit from fewer inputs. Heath also advised new growers to know the rules of certification and to do everything properly. Certification is important to get the price bonuses, he said. Growing organically also demands a lot of record keeping, and operations are subject to routine audits and inspections by the certifying agency and USDA. Jones recommends newbies get help in figuring out how to fill out all the paperwork, which requires a basic understanding of nutrient management and weed control. Certification costs vary widely, depending on the certifying agency and the size, type and complexity of the farm. Certification costs may range from a few hundred to several thousand dollars, according to USDA Agricultural Marketing Service. Typically, there is an application fee, annual renewal fee, assessment on annual production or sales and inspection fees. Once certified, producers can apply for assistance from the USDA Organic Certification Cost-Share Program — which can reimburse eligible operations up to 75 percent of their certification costs. Nearly 80 agents nationwide are currently authorized to certify organic farms. Longtime organic growers also advise new growers to seek out a mentor and network with others. Things can be a little scary that first year or two, they said. Most organic growers are happy to help novices, and the importance of taking advantage of that can’t be overstated, he said. “Networking is really important, especially for new growers,” Jones said.